The Cuisinart CSB-79 is a smart stick® 2 speed hand blender, has one touch operation and the ability to blend right in the port. It has a comfort grip handle. 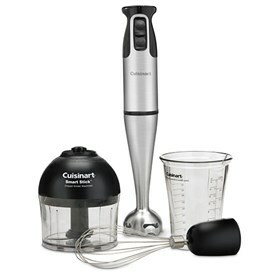 The 2 speed control, plus chopper/grinder and chef’s whisk attachments, let this hand blender perform the tasks of 3 food prep appliances. The 2 Speed Hand Blender Brushed Ss Smart Stick Hand Blender has many exciting features for users of all types. You can extend the lifetime of your 2 Speed Hand Blender Brushed Ss Smart Stick Hand Blender with the purchase of a FactoryOutletStore Factory Protection Plan. See the 2 Speed Hand Blender Brushed Ss Smart Stick Hand Blender gallery images above for more product views. The 2 Speed Hand Blender Brushed Ss Smart Stick Hand Blender is sold as a Brand New Unopened Item.